One in three of the children around the world who do not have access to primary education have a disability, says a report from the charity Sightsavers. The charity, which works to reduce blindness, cites figures from Unesco which would suggest that about 23 million disabled children are missing out on education. Such lack of access represents a huge barrier to achieving the millennium goal of primary education for all children by 2015. Sunit Bagree, co-author of a report from Sightsavers, argues that there is no real chance of the world meeting that target while so many disabled children are excluded. "I think the issue of disability has been under-reported historically," he says. "You can say there was a lack of attention to this aspect." The report says that disabled children are denied education because of a lack of physical access and specialist facilities. There are also cultural attitudes, such as shame, fear and embarrassment on the part of their families as well as teachers and other pupils. Mr Bagree says such reactions to disability are "most prevalent in the poorest rural areas, where traditional and religious beliefs can make people believe that having a disabled child is a form of punishment, related to the concept of sin". In some developing countries, the proportion of disabled children receiving an education can be as low as 1-3%. A survey of data from nine developing countries shows a pattern of disabled children being more likely to miss out on education - with this increased likelihood of exclusion ranging from 15% in Mozambique to 59% in Indonesia. Children in households with disabled parents are also more likely to miss out on education. The report does offer some hope, with examples of children whose lives have been transformed by educational initiatives. Based in Ghana, Sightsavers' social inclusion adviser for Africa, Gertrude Fefoame, is a powerful advocate for inclusive education. "At the age of 10, my eyesight was getting worse, so I reported I could not read," she says. "But nothing was done. By 14, I couldn't even read with glasses, I was in a mainstream school, I had no support. As far as my teachers were concerned, you were either blind or sighted, there was no in-between." She considers herself one of the lucky ones - she had been in school, she was bright, and she had friends who she could persuade to read for her. At 18 she was admitted to a blind school to learn Braille - at which point her friends' attitudes changed: "It was all, 'Oh! Poor Gertie!' and it really hit me hard, it was when I first realised that something was terribly wrong." She went on to become a special needs teacher - and she is "highly optimistic" that the necessary changes in attitude are gradually happening. Mukonde wants to be a journalist. 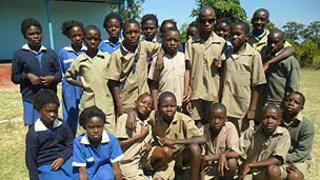 The 14-year-old pupil is one of 15 blind children at Mano Basic School in Mufulira District in Zambia. In this pilot project, supported by the ministry of education, sighted and visually impaired children study alongside each other. Miriam Nyendwa, the boarding mistress at the school, says the children with sight problems are not struggling in lessons. Out of the 15 visually impaired students, seven are among the top 10 in their classes. In future she wants disabled children across the developing world to be able to enjoy what she was denied - a full education in a normal school, with specialised help available. That is the model which she has been helping to pilot in Ghana, Nigeria, Zambia, Kenya - where the old special schools become resource centres and special educational needs experts become teachers who can move between schools. Mr Bagree maintains that this model benefits not just the disabled children, but all pupils, as well as teachers and the wider community. "It's also more cost effective in terms of running the schools." In Zambia, 15 schools are taking part in an inclusive education initiative, where teachers are being trained by four special needs co-ordinators. Mr Bagree says that the Zambian government, having seen positive results, is now putting money into inclusion. And worries about disabled children slowing everyone else down have been scotched. The failure to provide an education for disabled children is also worrying human rights groups. Human Rights Watch is concerned that the United Nations and aid agencies are not doing enough to ensure that funding to widen access education is reaching disabled children. The human rights group published a report about Nepal earlier this year which claimed that "tens of thousand of children with disabilities… are being shut out from or neglected by the school system". It reported that parents can't cope, teachers are not trained to deal with disabilities, and schools are often under-equipped and inaccessible. It gave examples of exclusion, isolation and great hardship in getting access to school, and disabled pupils being shunned by pupils and staff. There is also a push to raise the issue further up the political agenda. Earlier this month, former UK Prime Minister Gordon Brown, speaking in Qatar, admitted that many of the millennium development goals would be missed - but he called for a concerted international effort to achieve the promise on universal primary education. Sightsavers now wants to look beyond these targets to ensure that disability and inclusion are deeply embedded in the next wave of the international community's goals for widening access to education.